This story first appeared on April 30, 2014. In early 2014, just a single pair of ancient MiG-21 fighters defended the skies over the former Yugoslav republic of Croatia. The rest of the fleet was stranded in Ukraine, a country that seemed to be teetering on the brink of full-blown conflict. The MiGs made it back—just in time. For a small country like Croatia, keeping a close watch over your airspace is of vital importance. In the case of an aerial intrusion, or expected intrusion, seconds count. While the Soviet-era MiG-21 fighter may be far from the state of the art, it has several factors in its favor. It’s relatively cheap, reliable and can get into the air with little pre-flight preparation. And it can do it quickly. Since 1992, the task of Croatian air policing and air defense has fallen upon a fleet of single-seat MiG-21bis and twin-seat MiG-21UM fighters belonging to the air force’s sole fighter squadron. Croatia’s history with the MiG-21 dates back to the Homeland War, the nation’s struggle for independence that broke out in the summer of 1990. Initially relying upon adapted agricultural aircraft and bomb-carrying Cessnas borrowed from flying clubs, Croatia received its first MiGs via defections from Yugoslavia. The type saw combat service during Operation Flash in 1995, when Croatia secured a key strategic victory against rival Serbian forces. After independence, Croatia’s MiGs took part in exercises organized by NATO’s Partnership for Peace program—and also flew dissimilar air combat training with the U.S. military. This gave them the chance to go toe-to-toe with the U.S. Navy’s F/A-18 and F-14 carrier fighters. With a more capable fighter—even a fourth-generation type like the F-16—beyond its reach, the Defense Ministry in Zagreb elected to prolong the life of its MiGs. In 2003 the survivors were sent to Aerostar in Romania, a company with much experience in overhauling and updating MiG-21s for both domestic and export clients. Here, workers fitted the jets with NATO-compatible navigation and communications systems and transponders that also met international civil standards. Otherwise, the fighters remained strictly Cold War-vintage. Currently, Croatia’s force of MiG-21s comprises a total of eight MiG-21bisD and four MiG-21UMD jets. The “D” in the designation indicates that these aircraft passed through overhaul with Aerostar. For its Quick Reaction Alert mission, a pair of MiG-21s stands armed with R-60 heat-seeking air-to-air missiles at Zagreb-Pleso air base, near the capital. The remainder of the squadron is normally at Pula on the Istrian peninsula, where training takes place. The combat-proven MiG has served Croatia well. So the Defense Ministry decided to further extend the service life of the jets, as well as acquire “new” specimens. The existing MiGs’ lifecycle was set to expire in November 2013. In March 2018 Croatia decided to acquire 12 used Israeli F-16Ds to finally replace the MiG-21s by 2020. The Ukrainian Aviation Repair Plant at Odessa won a €13.9-million contract to overhaul four MiG-21UMD two-seaters and three MiG-21bisD single-seaters, as well as another five newly purchased single-seaters. The latter were previously supposed to go to Yemen, in a deal that never materialized. The Ukrainian firm was to bring all 12 aircraft up to “D” standard. The first three MiGs returned to Croatia in mid-October 2013. But problems with the upgrades slipped this date to December 2013. In particular, integrating nav/com equipment from a Czech company proved troublesome. 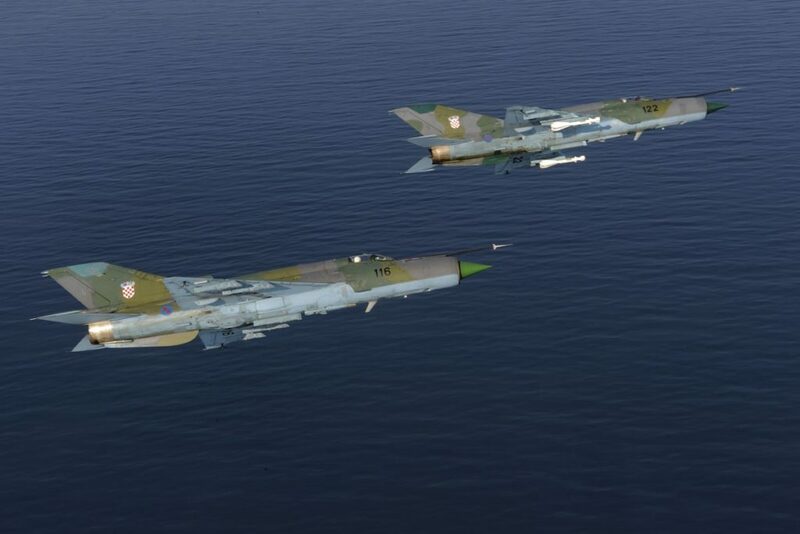 While a Croatian pilot finally began test flights of a newly purchased and overhauled MiG-21 at Odessa in November, the Hungarian defense minister reportedly offered fighters from the Hungarian air force to provide short-term air defense coverage for Croatia, should it be required. While the initial problems at Odessa were technical, politics then intervened—and threatened even more serious consequences for the fighter deal. Following mass demonstrations in Kiev that toppled the pro-Moscow president, Russian forces annexed Ukraine’s Crimean peninsula—and subsequently massed on the country’s eastern border. Croatia needed to get its fighters out of Ukraine fast. After months in limbo, the first overhauled MiG-21bisD returned to Croatia on April 12, 2014. The jet came by road, via Hungary. Bearing in mind the deteriorating security situation, road transport was the quickest route. By mid-April 2014, a team of Ukrainian technicians was expected to arrive in Croatia in order to reassemble the MiGs and prepare for their final testing and handover. A second MiG-21bisD left Ukraine a week later and three jets were now in country. The new jets’ NATO-style overall gray air superiority camouflage and revised low-visibility insignia set them apart. Another two single-seaters soon completed tests in Odessa. Flight tests also began for the first of four two-seat MiGs, which Croatia badly needs for training pilots. Rapid delivery of the fighters is also in the interest of the Ukrainian side, since no payments were due until after the aircraft were delivered and Croatia accepted them. Croatia had high hopes of acquiring a squadron of 12 advanced fighters, either new or second-hand, to replace the veteran MiGs. The Saab Gripen was seen as a likely candidate, thanks to generous offset deals. But financial realities ruled out the Swedish-made fighter. Second-hand offers of former German F-4F Phantom IIs or Spanish Mirage F1s looked attractive at first glance, but the operational costs of both would have been prohibitively high. It took years for the Croats to settle on the Israeli F-16s as the best and most affordable option. In the meantime, the Czech Republic and Slovakia announced that their air forces would begin joint air patrols starting in 2015. Although the two countries went their separate ways in 1993, they have recently begun to see the advantage of pooling military resources. Given their violent history, a similar cooperative air policing agreement between Croatia and Serbia can be ruled out. Another former Yugoslav state, Slovenia lacks fighters of any kind and instead relies on the Italian and Hungarian air forces for its protection, under a rotating NATO air policing framework. Since they are so close, the Italian and Hungarian fighters can cover Slovenian airspace from their home bases. Such an initiative might work for Croatia, too—the country being an alliance member since 2009.